I made this fairy princess castle cake for my little girl’s 3rd birthday party, seeing her and her friends reaction when we brought it out made my day ! It took me 2 days non stop but was worth every moment . I baked 10″ 8″ and a 6″ round sponge cake, filled each with jam and butter cream then covered each cake with butter cream icing. When that had set I covered each cake with a second layer of butter cream then covered with fondant icing that I had pre coloured with gel food dye. Once I’d smoothed the fondant icing down I then rolled little balls of icing and flattened it with my fingers to make the stone work attaching each one with water. This took the most time ! 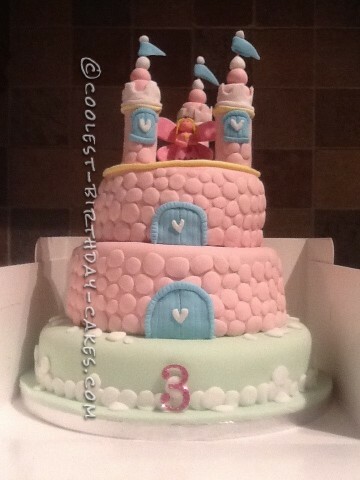 The blue doors and windows were also colored fondant and the turrets were made out of small Swiss rolls covered in fondant icing . This was my 1st attempt at making a birthday cake, my partner thought that I’d bitten off more than I could chew ! So I just had to prove him wrong. Birthday cake idea posted by Vicky C.